Instead, if you’re like me and many others, opening your business inbox has become a soul-sucking experience that consumes too much time, distracts you from more important tasks, and leaves you feeling that in spite of all the time you spend in email, you probably missed something important. Yet with all of its flaws, you continue to use email because it has become a seemingly irreplaceable part of the business workflow. Sending an attachment for 94% of users. Sharing files while on a call for 60% of users. That nagging feeling that I’ve missed something (especially in all of those crazy Google threads!). Spending too much time catching up on email after work hours so I’m not swamped the next day. For better or worse, this is easier than ever because I can do it on my iPhone. Spending too much time searching for that one, elusive email that I really need. Toggling back and forth from my email to calendar to find open time for meetings. Getting back to what I was supposed to be working on after be email distractions. But, despite these problems—and the emergence of newer digital communications methods (social networking, activity streams, text messages, IM, etc.) touted as email replacements—email is still very much alive and well. While newer methods are making some headway (and in fact, reducing email use in our personal lives), email remains the top form of business communication. In fact, 52% of those surveyed by Osterman Research indicated that their use of email had actually increased over the previous 12 months, while for 44%, use remained the same. Use declined for only 3% of respondents. To be fair, email has evolved since the first email with an @ sign was sent (reputedly in 1972, by Ray Tomlinson, an ARPANET contractor and Internet pioneer). Commercial developers got in the game, and developed folders to organize email, offline synchronization, standards and protocols, web interfaces, search capabilities, spam filters, ways to pre-sort emails into different buckets and more to make email more user-friendly and usable. Although these improvements have helped somewhat, the original paradigm of looking at a big long list of stuff—emails, files and folders—remains. We’ve gained more ways to slice and dice our inbox, but it’s still served up to us in pretty much the same way as it has always been, in rows of information. Newer social and collaborative tools, from activity streams to file sharing apps have been developed to make communication and collaboration easier, and to reduce and/or replace email. But while they are a great fit for certain tasks and activities, they haven’t displaced email to any great extent. Email volumes continue to multiple, and email overload continues to plague us. But what would happen if you began with the premise that email isn’t likely to go away? And that since people spend a lot of time in email, it should be a place where people like working and can be more productive, and that easily integrates with newer social and collaborative tools, instead of competing with them? In other words, how can you have an inbox that works for you, instead of the other way around? This is the premise that IBM team has zeroed in on with IBM Verse. Verse is designed to help people focus on, find and act on the most important things in their inbox in a more intuitive and integrated fashion. Big Blue has invested $100 million to design the solution, which combines its cloud, analytics, social and security platforms. See what replies and tasks you owe others. View meetings and free time. Identify what’s most important in your inbox. 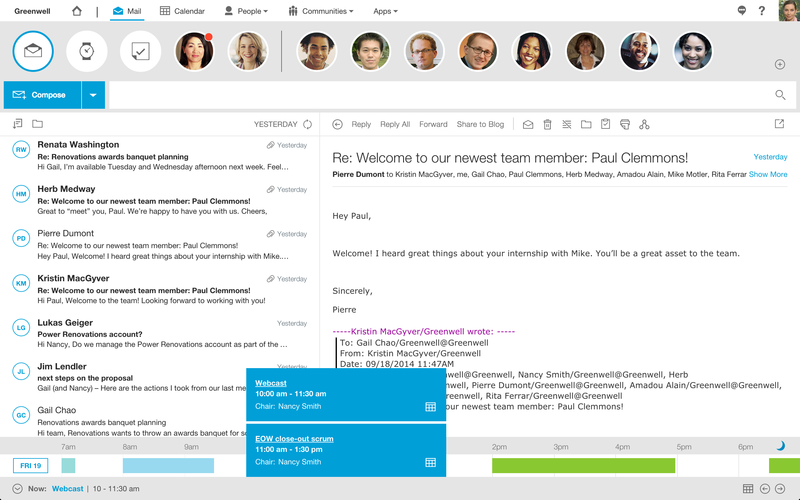 Move over a face to see that person’s emails, chats, invites and more all in one place. Pull up and attach links to files and manage version control. “Unlock” emails and turn them into social posts to share with a community. Use team analytics to create social graphs to see how active different people are in a thread. Create rules to sort, filter, mute and hide messages. IBM Design Thinking, IBM’s design framework for delivering great user experience to users. Is also taking a different approach to designing IBM Verse. Instead of testing the user interface after some (too often) wonky developers come up with it, product management, development and design all work together equally from the beginning. Using tools such as IBM Digital Analytics (formerly Coremetrics) and other technologies from its portfolio, IBM can continually personalize and prioritize email and social activities for users and improve search. Over time, according to IBM, Watson will provide much of the analytics behind IBM Verse, with the goal of providing users with more insights and less overload from their email. IBM Verse will debut as a cloud service (but IBM is prepping an on-premises version as well). Key sponsor and design advisory users have been reviewing, testing and helping co-create the solution since August. The solution will officially premiere in November as one of just eight IBM “Signature Moments,” putting IBM Verse on par with the IBM-Apple deal. After that, IBM Verse will enter beta mode, with general availability slated for March 2015. IBM will provide Notes Domino users with a preview and transition to IBM Verse. Notes Domino users will be able to use IBM Verse in combinations with Notes Domino and with IBM Connections. IBM will also offer a standalone Verse solution of Verse in a freemium model, to compete against Google Gmail and Microsoft Office 365. As an SMB analyst, the standalone version is of most interest to me as this is the first freemium IBM has offered. The freemium model will provide entrée to an app that almost every business needs, and has the potential to generate viral adoption for an IBM product—another first for IBM. Will IBM Verse Measure Up At the Box Office? But it’s not a slam-dunk. IBM Verse should provide Notes Domino users a more compelling case to stay the course instead of defecting to Microsoft, Google or other cloud-based mail alternatives. However, most Notes Domino users have a lot of applications, many internally developed, running on the platform. IBM Verse will need to be able to run, expose and interface with these apps to make the transition truly easy. Meanwhile, as alluring as the IBM Verse demo and interface is, gaining traction outside of the Notes Domino installed base will be extremely challenging. For starters, many companies, especially small and medium businesses (SMBs), are already using cloud-based email and collaboration solutions. SMB Group research indicates that 49% of small (1-99 employees) and 40% of medium (100-999 employees) already use cloud-based email and collaboration solutions. 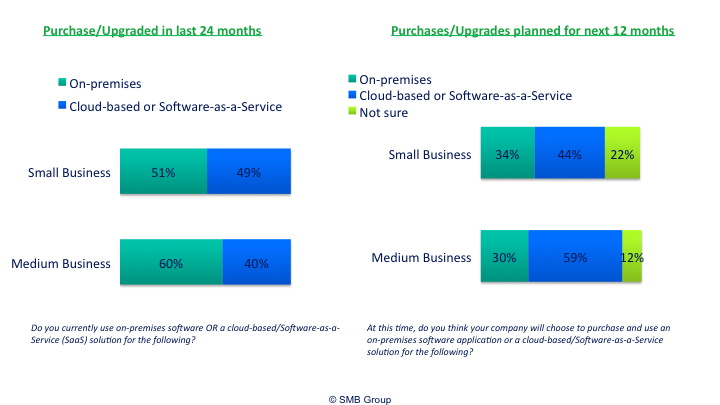 Furthermore, the preference for cloud among SMBs planning to purchase or upgrade collaboration solutions is strong (Figure 2). In addition, IBM will need to make a strong case to business decision-makers and end-users, as well as to IT. IBM will not only need to create broad-based awareness for the solution, but convey why and how it’s different from other email solutions, and how it directly benefits users—aka “what’s in it for me” to move the needle. Deeply internalize sponsor and beta user feedback, not only to influence solution development and design, but also to ensure that IBM Verse messaging, positioning and marketing reflects the user voice and experience. Heavily socialize the IBM Verse concept across events, social media, communities, influencer groups, etc. Maximize conversion of users that try IBM Verse to users that buy, or in the case of the freemium, stick with IBM Verse and make it their corporate mail system. It’s easy to get people to download free apps, but tough to get them to test them and tougher still to displace an existing solution with a new one. As a solution, I believe that IBM Verse is launching with the right stuff, including. As a cloud first solution, IBM Verse can tap into the growing number of companies that opt to start with or move to the cloud. IBM’s design thinking team aligns with where users are today: helping people get more done, more quickly with fewer menus, mouse clicks and a more visual representation. “Personal analytics” taps into user concerns about information overload, and the desire to manage email more intelligently. But, only time will tell if IBM’s elevation of IBM Verse to Signature Moment status—and the marketing power attendant with this—will be enough to ensure that IBM Verse will become the blockbuster hit that IBM is hoping for. This post was sponsored by IBM.